Last season i tried out the “active shooter” bag concept/setup for my local rifle competitions. I like the concept of an active shooter bag for I believe it is important to have a dedicated weapon bag to grab and go if things go sideways locally. I have used my grab bag for about a year and I have some observations: It likes to flop around, and it likes to jump under you when going prone. Along with your rifle sling, it’s just another strap that likes to get caught on things. Despite being a very simple grab bag, these shortcomings really jump out at you when in use. I can’t imagine the weight of a patrol officers active shooter bag compared to mine. If it is slung on the weak side, with your rifle slung to your strong side… you have a noose around your neck. If you have a bag, be sure to practice hard with it so you can check its behavior. It is a compromise system designed for you to grab and go without additional setup. If you knew danger was eminent the grab bag would be a pretty crappy setup compared to a belt, dedicated pouches, and molle. Since my needs vs law enforcement differ greatly I can afford to have a lighter “go bag” than them. A few magazines and reloads for my weapons, first aid supplies, and glow sticks. The glow sticks draw attention to an area and would be useful if I had to mark an area of interest such as an injured person. If I ever had to use my grab bag as a civilian… I would be having a very bad day. I also keep a second, smaller bag in my car. I keep it ready with lots of 9mm for my ccw piece and a few extra bits that might prove useful in a car breakdown: lighters, waxed cotton balls, rope, water purification tabs, and a few other outdoor nick nacks. If chaos ever strikes it won’t care that your stuck in rush hour traffic. I don’t stash a full AR in my car like some of you guys out there, as I worry about theft. If I am out and about my weapon is on me, in this case a G19. Keep in mind if you had to remove yourself from an area in a disaster while out around town breaking out the AR15 will draw law enforcement’s attention. The G19 also allows me to keep a low profile. The key would be to get home without getting into a gunfight or running into LEO’s. If a sudden natural disaster happened, being the only guy on the freeway with an AR15 will attract the eyes of the law enforcement. If you can go through the woods, all the better… but I know personally on my commute I could not avoid semi-populated areas, so for me it’s important to go low-profile. I like the concept of an active shooter bag… But it has its place. Don’t base your entire setup around it as it does impact mobility and disrupts several shooting positions as it shifts around. Grab it when there is no time to gear up. Configure it to your needs. Have a plan. 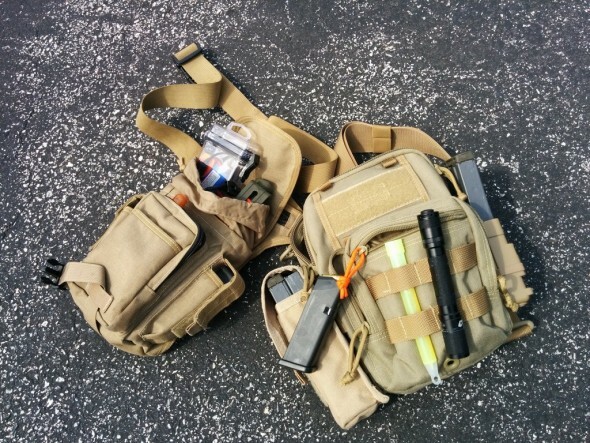 Maxpedition has a new active shooter bag on the market and it looks like a much cleaner package then my setups. Is the Sierra Tipped Match King the Best Choice for the AR… ever? To be fair, in an active shooter situation I intend to be heading AWAY from the fight so as not to have some LE responder think I’m badguy #2 and get a medal for putting a Speer Gold Dot in my head while I was trying to help. Durk, good luck dealing with yourself on that.